A Cleveland winter doesn’t have to mean “dormant” for your commercial landscape. As we move into the cold season in Northeast Ohio, there’s an opportunity to tackle maintenance tasks like corrective pruning and tree removal.And, you can plant until the ground freezes. Not to mention, the fall color you pop in the ground now—namely pansies and violas—will stay hardy into the holidays and be the first to pop in spring. At Schill, we like to conduct walk-throughs with commercial property managers at this time of year to identify areas we can improve and possible enhancements to consider for winter and beyond. Now is prime time to plan projects that will take you into the New Year and early spring. If you’re interested in adding winter interest to your Cleveland property’s curb appeal, here are five winter landscaping services that will keep it from looking like a sleeper this winter. Once the growing season slows down (and even halts), you can perform corrective pruning on trees and shrubs to reshape them and reinvigorate beds. You’d be amazed at how a landscape bed literally opens up with corrective pruning. Corrective pruning makes a big impact. The best time for significant pruning is now through March. By removing dead wood from shrubs and trees—and taking care of some basic fall clean-up—you improve the health of plants and the appearance of the landscape. Want to learn more about how to care for your lawn in every season? Certain perennials are “multipliers,” and over time they can expand and bloom beyond borders. Winter is a great time to split perennials like hostas, black-head Susans, daisies and groundcovers. Then, transplant them to areas of your commercial landscape that could use some fresh plantings. Splitting perennials prevents overgrowth and cleans up the look of a bed—and you’ll preserve the health of plants this way. If perennials grow too large, their bloom time is not as brilliant or lasting. And, you can maximize your commercial landscaping budget by using materials that are already growing strong on your property. Survey your property now and identify landscape beds that could use a boost—more color, more plants. Note perennials that are growing out of control. Before snow falls, while you can still see the landscape, is an ideal time to plan out any transplanting you’ll do once perennials go dormant. Tree removal companies tend to be slower in the wintertime, so you may secure a lower price—and that can amount to big savings if you must take down a large tree. Most landscape maintenance contracts cover tree pruning up to 15 feet. This summer’s drought in Northeast Ohio left many commercial properties with bare spots in their lawns. With cooler weather, you can aerate the lawn to reduce compaction; and overseed to fill in sparse turf, damaged areas or completely bare spots. As with transplanting, new seed requires less water and nutrients to establish in late fall—and then in spring, your commercial property will green up as a nice, full lawn vs. waiting until spring to overseed. Tuck bulbs into soil now before the ground freezes and you’ll be rewarded with early color. Crocuses, daffodils and tulips bloom before spring annuals go into the ground. In fact, late fall is an ideal time to plant, in general. Shrubs and perennials tend to require less aftercare because temperatures are cooler, and the ground contains more moisture. Plus, plants that are dormant simply don’t need all that much TLC. We recommend avoiding more vulnerable shrubs like boxwood and tender plants like hydrangea or roses. But hardy perennials and evergreens are resilient and last through Ohio winters, even if they are planted right before the snow falls. 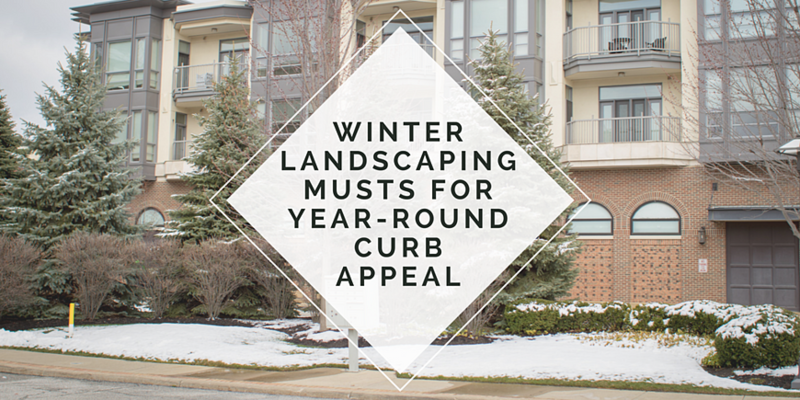 Keep Your Curb Appeal This Winter. 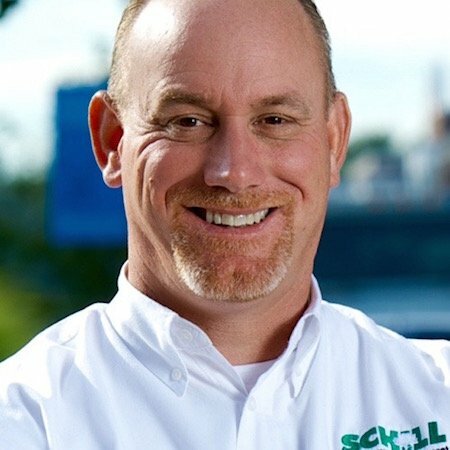 Schill Can Help. We know, winter in Northeast Ohio means snow and ice—and we are focused on creating winter storm management plans for commercial property owners so they’re prepared to keep their sites safe and clear this season. Download our handy guide to learn more about hiring the best Snow Management contractor for the job. But landscaping services don’t halt while snowplow season is in full swing. We encourage you to take advantage of the months between fall and spring. Look at this time as a window of opportunity to check must-do pruning, transplanting and clean-up services off the list. That way, when spring arrives you’ll be ahead of the game. Let’s talk more about how you can maximize your budget and plan for winter landscaping services. Contact us any time at 440.327.3030, or fill out this simple contact form and we’ll get in touch with you.